We need more people like you in this debate. In America standing up for the rights of Palestinians mean you are anti-Semite. 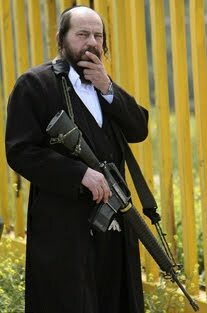 I am sick and tired of this nonsense, finding you, a Jew, gives me hope that one day this massacre will end. I also believe that things are starting to shift a bit in the United States, obviously not among the morons -as you called them, lol- but there is an increasing group of people who are speaking up against the genocide of Palestinian by Israel. Thanks for you wonderful tweets, and the exquisite posts. Keep up the good work. I get the feeling that you're about to be bombarded with abuse from hundreds of frothing-at-the-mouth Zionist lunatics. You know the type; they deny the very existence of the Palestinian people as a people, insist that Israel has always existed as a sovereign nation and view themselves as superior to Arabs to the extent that they shun Sephardi and Arab Jews. Vile people, truly vile. Excuse me but if you think that the coverage of the Itamar massacre was "hard to avoid," not sure what media outlets you read. There was barely mention of it in the US media. Any time an Israeli touches the head of a Palestinian, regardless of provocation, the UN meets to condemn. Evidence of Palestinian terror is far more embedded into the Palestinian psyche than any "Zionist terror." Unfortunately, what you and your two little followers are doing is trying to blame all Israelis for the act of a few, yet when Palestinians lob missiles at southern Israel giving Arabs and Israelis less than 5 minutes to find cover, you say "oh, that's not the norm." What you are spewing is the exact kind of hate that you are allegedly trying to stop against the Palestinians. And for the record, I 'll be shocked if my comment even appears. Wow, you are hateful. And speaking of "simple points" about UN charters – what about the one that established Israel as a state. You've all but forgotten that one, or how about Hezbollah having to disarm. Funny how you forget that one too. Palies give up violence and acknowledge Israel's right to exist, then we have something to talk about. BTW, definition of "Genocide." "the deliberate and systematic extermination of a national, racial, political, or cultural group," believe me, if Israel wanted to exterminate the Palestinians, there would be none left. Hmmmm runforfun54 – you seem not to know the difference between the state of Israel and the West Bank. This isn't about legal citizens of Israel, it's about armed terrorist fundamentalists who are illegally occupying the West Bank. Go do your research then we'll chat some more. Imao runforun54! You seriously need to get your facts straight. You live in a different world apparently, but its OK. Just do as moronwatch said and do some real research, you wont regret it. Notice the term "real." "…what about the one that established Israel as a state." Additionally Runforfun54, the UN resolution that officially established the State of Israel established very different borders to those of Israel today. It also stipulated that Jerusalem was to be an international city under UN mandate. I wonder, is it Palestine or Israel who has run rough shot over that resolution for the past 50+ years. I'll give you a clue, it's the one that has a functioning state and military infrastructure and which has periodically pursued expansionist adventures in the others territory. "Unfortunately, what you and your two little followers are doing is trying to blame all Israelis for the act of a few…"
You do understand that the word Zionist isn't synonymous with the word Jew or Israeli right? Nobody here is blaming every Israeli for the actions of the settlers, a collection of religious fundamentalists (Zionists) who believe that all of Palestine is theirs by divine providence. Hence the strategic use of the word Zionist (Duh!). I do want to commend MW for inspiring me to dig deep into the history here. I will point out that a lot of people who want to talk about this issue seem to think History began in 1948. That's simply not so, and to ignore events that led up to that point (and I am not talking just the 20th century, but farther back as well). I recall, MW, this event, but, I do trend to the Internet and those right-wing news sources, so perhaps I was more inclined to know the details. However, I agree that the mainstream media here in the states does cover plenty of Israeli actions against the Palestinians. I know you don't live here, but lately, at least, it's quite fashionable to take up the Palestinian's cause, especially in the left-wing dominated media. Because I want to give you, MW, a chance to educate me (a moron), help me out with points 1and 3. Are you saying that the Israeli's and Palestinians are in a state of war? Has that state existed since 1948? Was war ever formally declared by either side (I am struggling with how a stateless Palestinian people could declare war, except through the PA – and I don't mean now, I mean in the '40's)? I'll eventually get to this in my personal research, but maybe you can short-circuit that by pointing me to what legally supports your argument that Israel's occupation of the West Bank is an illegal occupation. I'm honestly asking, because in my study, I am still at the 48-49 war period, and I believe the West Bank/Gaza area came into question after the 1967 War. Liberal Jewish Israelis who are against settlements are still zionists. But antisemites have decided that “zionist” only means the worst possible things imaginable.